For many, palm oil has become synonymous with environmental devastation in Southeast Asia. Can palm oil production in Africa follow a more sustainable path forward? March 26, 2019 — For many consumers, palm oil has become synonymous with environmental devastation in Southeast Asia. The industry has brought mass deforestation to the region, shrunk orangutan habitat beyond recognition and compromised local livelihoods. Indonesia, in the process, rose to become the third-largest contributor to greenhouse gas emissions. The Roundtable on Sustainable Palm Oil (RSPO), a partnership between stakeholders in the palm oil industry, such as producers, retailers and NGOs, was created over a decade ago to make the industry more environmentally and socially responsible. It helped, but critics argue the industry is still a long way from sustainable. Meanwhile, the palm oil industry has grown in other parts of the globe. 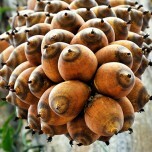 Latin America, for example, has seen an uptick in palm production. And over the past decade or so, large-scale palm oil production has expanded into West and Central Africa. While some people have welcomed this in hopes it will bring economic opportunity, a number of communities are trying to resist — either the presence of the industry itself or the way individual companies operate in their countries. How these efforts play out could determine whether the industry can find a way to be more sustainable in Africa, and also the fate of communities across the continent, not to mention that of nonhuman primates. 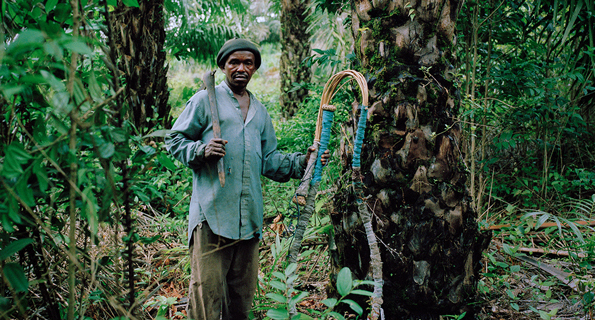 “Palm oil companies will not just displace [people in affected communities], but their culture, their history, their value, their traditional institutions, will all be completely altered,” says Alfred Brownell, founder of the Liberian lawyers network Green Advocates and currently a distinguished scholar in residence at Northeastern University School of Law in Boston. He lives in the U.S. in exile out of fear for his life, after he says he was threatened by private security guards protecting land being cleared of sacred sites to make way for palm oil development in Liberia. But he has represented indigenous communities in Liberia’s Sinoe County, where residents say that since the palm oil company Golden Veroleum Liberia (GVL) arrived in 2010, crops have been destroyed, shrines desecrated, burial grounds and grave sites denigrated, rivers diverted or dammed, and precious wetland areas polluted. Unlike in Indonesia and Latin America, oil palm is native to West Africa, and an important traditional crop with a variety of uses. 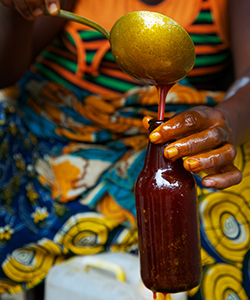 Here, a woman pours processed palm oil into a glass bottle in Masethele village, Bombali District, Sierra Leone. Liberia is home to the largest remaining tract of West Africa’s Upper Guinean forest, which has some of the richest biodiversity in the world. In addition to wetlands and farmland that communities depend on, the forest is threatened by expanding palm oil production, among other commercial activities. If it disappears, Brownell says, so too does the spiritual connection that many indigenous communities have with it. “That’s why we took this complaint before the roundtable,” he says. That’s because it’s cheap, and there are more uses for it all the time. It’s in all kinds of packaged food, from crackers to ice cream to instant noodles, and the rapidly growing consumption of processed foods globally is a big reason for the exploding demand. It’s also used in soap and cosmetics, in biodiesel, and as a mineral oil replacement. And because it is a very productive crop, impacts on land use could be even greater if the world were to try to replace palm with a different vegetable oil. World production of palm oil. (a) Percent of Food and Agriculture Organization (FAO)-reported total global oil palm harvested area in 2013. 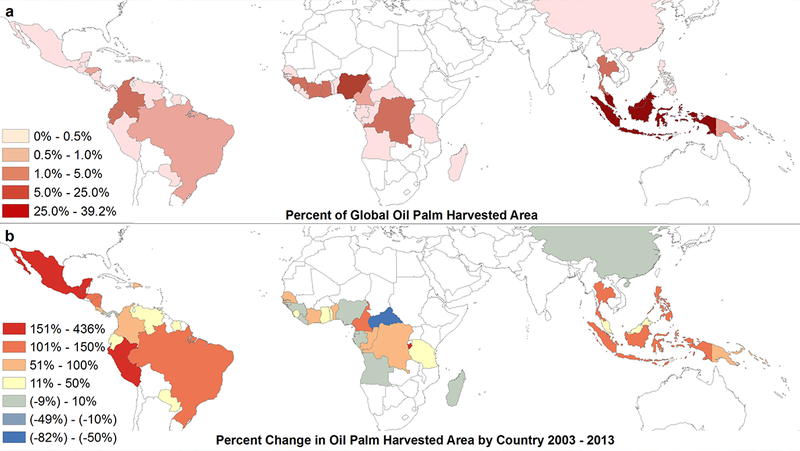 (b) Percent changes in FAO-reported oil palm harvested area by country, 2003–2013. https://doi.org/10.1371/journal.pone.0159668.g001. Source: Vijay, V., Pimm, S. L., Jenkins, C. N., & Smith, S. J. (2016). The impacts of oil palm on recent deforestation and biodiversity loss. PloS One, 11(7), e0159668. Click image to enlarge. From Liberia to the Democratic Republic of Congo, a battle has been emerging in recent years over where and how palm oil should be developed. There are concerns about impacts on local water supplies, wildlife populations, biodiversity and climate change. But the heart of the matter, what’s making communities speak out en masse, is control over land. To expand their palm oil production, a number of companies have relied on what critics describe as land grabs. Communities aren’t opposed to growing oil palm. Unlike in Indonesia and Latin America, oil palm is native to West Africa, and an important traditional crop with a variety of uses. But in the past it has grown wild or been integrated into fields with other crops. The large global producers rely on monoculture plantations. 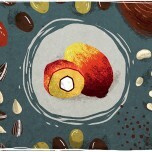 The RSPO was established in 2004 to create environmental and social standards for the palm oil industry. 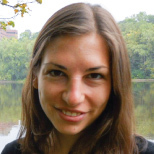 A number of environmentalists and human rights groups, however, have criticized it as ineffective or not effective enough. One study that evaluated a set of sustainability metrics on palm oil plantations in Indonesia found no difference between plantations that were RSPO-certified and those that were not. Another found that certification was sometimes associated with lower rates of deforestation, but many plantations were in areas where much of the forest had already been destroyed. Kuyek points to a plantation in Gabon, part of which is RSPO-certified, where 72,000 of the 144,000 hectares (178,000 of the 356,000 acres) committed are for protection of high-value forest and other areas. But because much of the land under contract in Africa hasn’t yet been planted, there is still opportunity for a different path forward for much of what could be the world’s next palm oil hub. And the community backlash has been swift in many areas. Krakue says the RSPO does more good than not. “Things would be absolutely worse off [without RSPO]. Even though the way they treated the complaints coming from Liberia was not satisfactory,” he says, “at least the RSPO serves as checks and balance for these companies.” But he and other advocates think there is a lot of room for improvement. In Sierra Leone, Namati, a nonprofit that works with grassroots legal advocates around the world to help communities demand enforcement of laws meant to protect them, helped a community win a court ruling in November that ordered a Singapore-based palm oil company, Siva Group, to return land to the community and pay hundreds of thousands of dollars in unpaid rent. 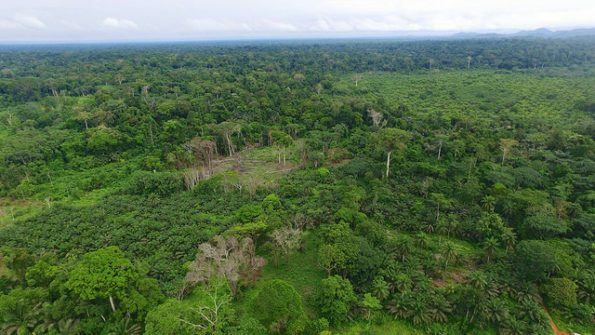 In Makpele Chiefdom in southern Sierra Leone’s Pujehun District, Namati represented landowners who had lost vast amounts of land in a lease they weren’t made aware of until after it was signed by an acting chief for the region. They negotiated a new lease that reduced the amount of committed land from more than 30,000 hectares (74,000 acres) to 2,300 hectares (5,700 acres) and established an “out-grower” model. The specifics of this model vary from site to site, but typically the company operates some land as a plantation and also provides smaller plots of land on which local farmers can cultivate palm trees independently. It allows, in other words, for contract farming, rather than relying on one company to provide all the employment opportunities. 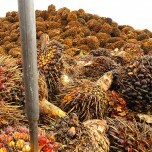 A number of community advocates think that this kind of out-grower scheme, though not perfect, may offer a path to palm oil development that is less destructive to the environment than it has been in Asia and more inclusive of local communities that can benefit from the development rather than be displaced by it. Large-scale operations provide “work for only two or three months in the year, and if you have given all your land to the company, then you have nothing to fall back on,” says Sonkita Conteh, country director for Namati. With the out-grower model, “you still get the output the companies require, and at the same time you are also helping farmers.” They have jobs year-round, and the smaller farms don’t have the same impacts on water supplies or use chemicals as intensively as the large plantations do, Conteh says. Sierra Leone passed a law in 2016 that requires companies investing in agriculture to create out-grower opportunities for small farmers. In Liberia, Krakue says discussions are also underway between companies and farmers to establish out-grower contracts. Ryan Zinn, regenerative projects manager at Dr. Bronner’s, a for-profit company that makes soap and other personal care products, is a little more skeptical of the out-grower model, saying the farmers can only really benefit if there’s not a monopoly on the local market. Otherwise, if there’s a disagreement, over price or quality, for example, farmers can be left without a buyer. For Brownell, it does come down to those brands that buy the palm oil for their products. Palm oil producers aren’t vulnerable to the kinds of consumer pressures that can be brought against more familiar brands through actions like boycotts. In Ghana, about 600 farmers produce palm oil that they sell directly to Dr. Bronner’s. They grow on their own land or on land that they lease from, say, a neighbor — not on land controlled by the company — and can sell to any buyer they have access to, although Dr. Bronner’s pays premiums for fair trade and organic production. Zinn says the company is now working with farmers to add a more diverse, agroforestry-based approach to growing palm oil. 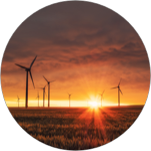 A more diversified system, he explains, is more resilient against climate change and also provides more stability for the local economy. We believe that if oil palm plantations are planted in a sustainable, well managed fashion with appropriate wildlife corridors, riparian buffers and protected intact forest patches then those companies adhering to the HCV and HCS approach can assist in saving Africa's great apes and other endangered fauna and floral species.